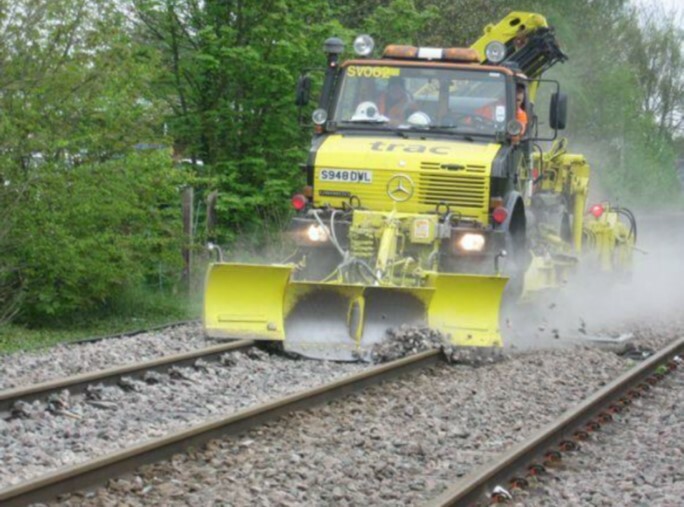 Scorpion Road Rail Ballast Regulator is equipped with front and side ploughs and a towed ballast broom to replicate the capabilities of heavy rail machines. The plough is arranged with a centre pivot to allow configuration either as a V plough or as a blade angled to either cess. An adjustable centre section allows ploughing of the four foot either at the top of the rail or at sleeper level. The wing pivot point is adjustable for both height and side shift with the wing itself further adjustable for droop and angle to the vehicle axis. The wing ploughs will create any required shoulder profile and will also transfer material into the four foot. An independent ballast broom has been specially modified to operate with the Scorpion. The specifically designed ballast broom incorporates side conveyor and rail web finger brushes and is pulled behind the Scorpion. Being fully road legal allows the Scorpion to be driven on the road, this ensures versatility if problems arise on site with access. Able to access, travel and work under LIVE OLE.